Prysm has added Guest Mode, a new feature within the Prysm Application Suite. Guest Mode enables Prysm customers to add outside participants, such as potential customers, partners, or contractors, to a Prysm Visual Workplace meeting, contributing to a more collaborative relationship that can immediately improve partnership productivity and lead to additional revenue potential. Guest Mode will be available this month. Prysm Visual Workplace offers features such as access through a web browser—no download required—and a secure cloud-based portal that offers real-time collaboration across any device or location. It also offers persistent workspaces, enabling meeting participants to continue a previous meeting exactly where they left off, including immediate access to contents from the previous meeting. With the Guest Mode feature, each licensed Prysm user can provide access to any third-party participant, inside or outside the host’s organization. Once inside, guests can collaborate in real time with the other meeting participants to share and edit content and brainstorm ideas for a rich collaboration experience in meetings. For enterprises in the United Kingdom, Prysm has also recently opened a new CEC in London. 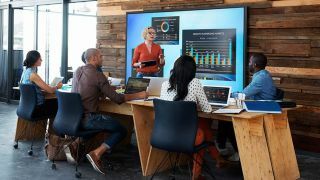 Prysm CECs enable customers to experience hands-on collaboration while learning about how other large enterprises are benefiting from Prysm Visual Workplace. A tour of the new London CEC can be scheduled by contacting the global Prysm sales team.